Avoid expense home problems with regular eavestrough and gutter cleaning. Gutters are hard to reach and this means you can’t see what problems you may have. Many serious problems result from clogged eavestroughs and downspouts. 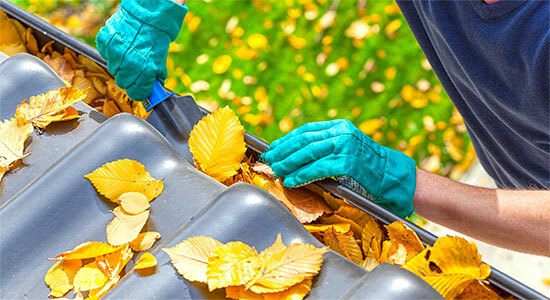 We provide full eavestrough and gutter cleaning services. Why choose us? 5-star customer service, 10+ years experience, and full liability insurance. Sealing leaking corners and joints with a high-quality sealant. This fixes your leaky eavestroughs and gutters once and for all.and gutters once and for all. Downspout guard installation. Redirect the flow of water preventing clogs using a simple and effective system. You need to do this only once. Flush out your eavestrough. We find out where exactly your pesky gutter leaks are enabling us to fix them once and for all. Good to do before the rainy season starts. We discover and fix any tiny holes which can turn into big problems. Professional eavestrough and gutter cleaning service. Our professional service includes hand cleaning of all eavestrough, gutters, fascias, and soffits. We use special tools to remove leaves, moss, and anything else hiding in there. Post-construction clean up of gutters is another service we provide. We’ll clean up the toughest stains or residues, leaving clean gutters ready to do their job. Cleaning your eavestrough & gutter system is critical. Destruction of personal property and expense stressful water damage are major problems. An overflowing eavestrough can cause all these and more. Standing water is another problem causing a build-up of pests and straining your gutters. Standing water will freeze in the cold winter months. Expansion of freezing water can cause your eavestrough to warp and fail. This can lead to gutters falling right off homes, with the potential to cause damage to people and property. When was the last time that you cleaned your eavestroughing and gutters? For most homeowners, it’s been awhile. It’s boring hard work that many homeowners put off doing. But gutter cleaning keeps your home in good condition. The reason homeowners should clean their gutters is to keep them working. Rain water away from you home prevents damage. Clogged gutters, eaves, and downspouts let water pour all over your home. This causes water damage, and basement flooding. The City of Toronto website lists overflowing eavestroughs and leaking or plugged downspouts as a cause of basement flooding. Basement flooding has been a big problem in Toronto. The City of Toronto even states it on their website. While eavestrough cleaning is a good step, you should consider your downspout as well. Downspout disconnection is another step for many homeowners to stop basement flooding. Mold is a huge problem that comes from eavestroughs. Mold spores are on debris and dirt that get trapped in your gutter. When spores combine water that is usually in a gutter, it leads to quick mold growth. That mold can get on your windows and into your home. Getting rid of your mold in your home is an expensive and time consuming process. Mold can also put your family’s health at risk. You can stop this risk of toxic mold, hire professionals to clean out your eavestrough at least twice a year. Cleaning out the eavestroughs on your home can be dangerous and dirty work. It’s much better to pay a little and have a professional clean them. Professionals have the equipment and knowledge to clean your gutters with no risk. Cleaning out eavestroughs is a dangerous home maintenance task. Many homeowners visit the hospital every year as a result of this work. Often people end up with serious injuries. Don’t put yourself in danger trying to maintain your home. Hire professionals who know what they’re doing. Cleaning out eavestroughs is dirty work. But you want to make sure that they are sparkling clean, with no damage to your home. Well, it’s best to hire a professional crew to take care of it! They have the expertise to get the job done right. Leaves, branches, or even animals or insects, gutter cleaners take care of the problem. Meaning you have functinoal eavestroughs, gutters, and downspouts.